Accumulating small bits and scraps of art glass is inevitable but nothing ever goes to waste. For this project I made a few pot-melts, AKA aperture pours, which is tossing glass scrap into a terracotta flowerpot and heating until it dribbles out the bottom of the pot. There are ways and means of trying to control the outcome of the design but mostly you won’t know until post-firing. I’ll post more about pot-melts later but this was an especially interesting one. My good friend, Nicki sent me a large batch of pink tiles she had made for the annual warmglass.com magless event. These were left-overs and I was using them for a separate fund-raising event. The pink tile is shown in the middle – I used maybe 20. You can see the melted glass residue in the terracotta pot bottom post-fire. This is a better photo of the result. I could not have planned or predicted this – it’s really pretty! 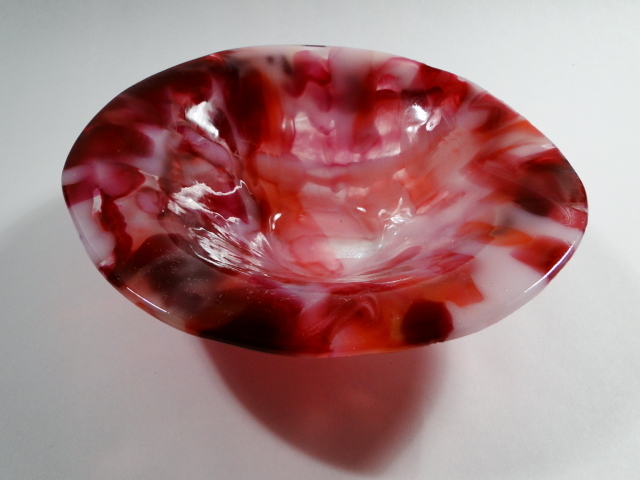 This cranberry pink bowl is grouped with the pot-melts but is actually called a ‘high fire’. Made by piling select scrap in a flat terracotta saucer; when allowed to melt and spread out within that confined area, it becomes a round flat disc. The edges of this are a bit irregular but I left it that way – it has character. 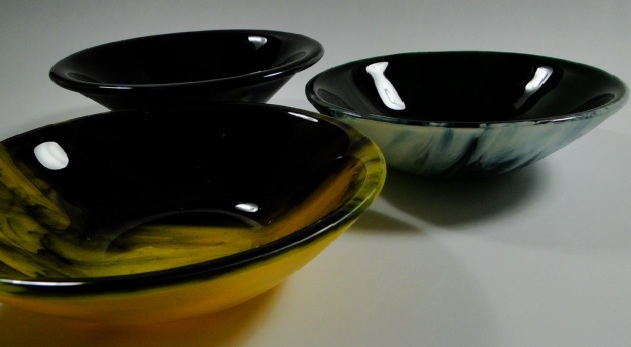 As time was approaching for the delivery dead-line I made a few more simple two-layer bowls using Bullseye glass streaky glass. It comes in sheets of white and clear; black and clear and french vanilla and clear. 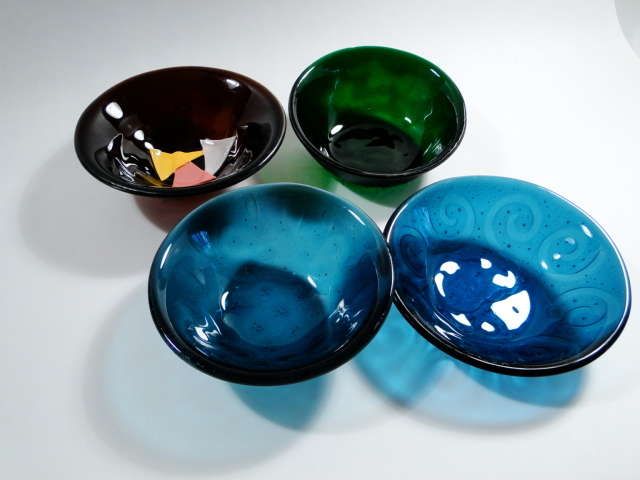 By pairing a circle cut from each of these with a contrasting base it was a fast way to make a pretty and functional bowl. I failed to get a good picture of these here is a hint. Thank you to Mary Farina, a Facebook friend who saw my posts on the project and volunteered to send this beautiful bowl. This will be placed in the Silent Auction and will fly out the door! Find Mary at facebook.com/gratefulglass. 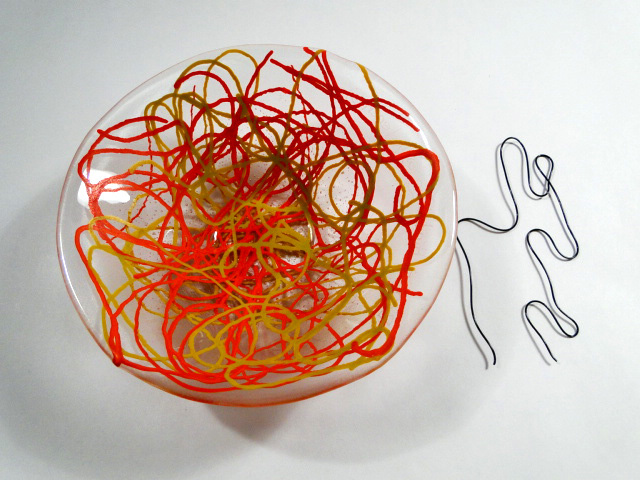 Thank you for those that came in to make a bowl and more. Many people contacted me but were unable to attend the scheduled times. I still appreciate that you tried. 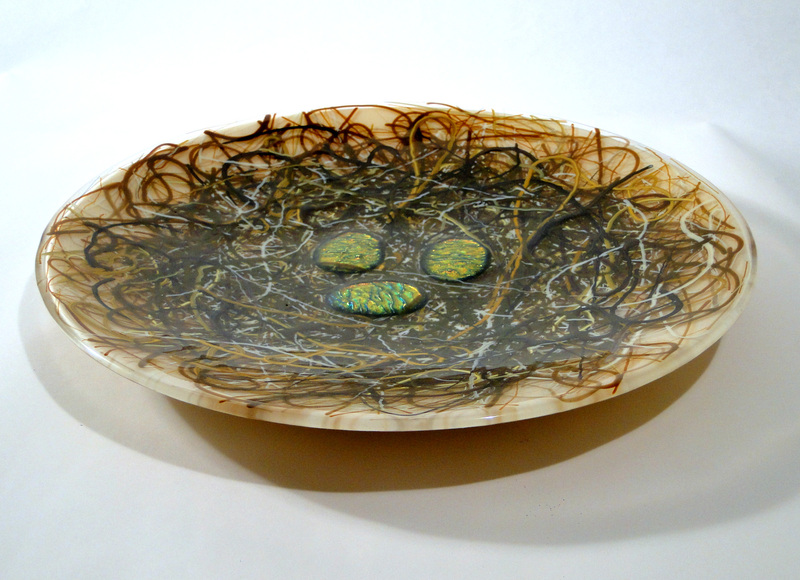 Christy K. made the kiln-carved blue bowl with clouds and spirals. She escaped before I could take her photo. This is Bonnie wondering if her design needs another vitrigraph stringer for her perfect design; after she had already mastered the aloe gel technique. Thank you Bonnie for driving to far to join us. It was a pleasure having you. Then there is Brandy – potter, photographer, and all-round good spirit. Brandy is a do-er and she proved that in the studio – literally. She made great bowls but also cleaned up behind us; washed and ground glass, cleaned, signed and photographed the bowls. She is credited with a portion of the photos posted. Find Brandy here. 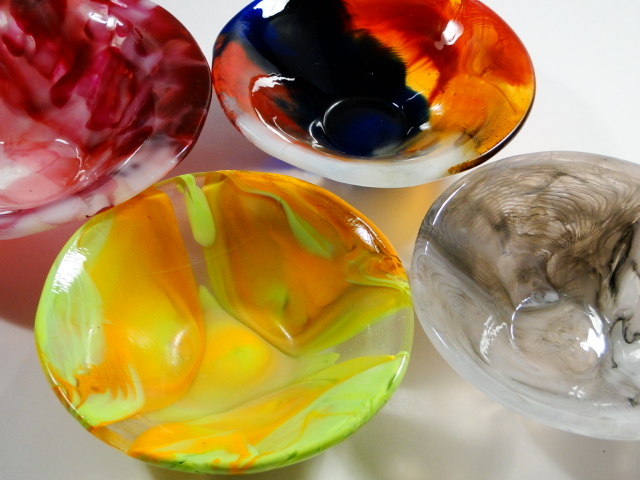 As we made more fused glass blanks, it was clear we did not have sufficient molds to shape them into bowl forms at the end. 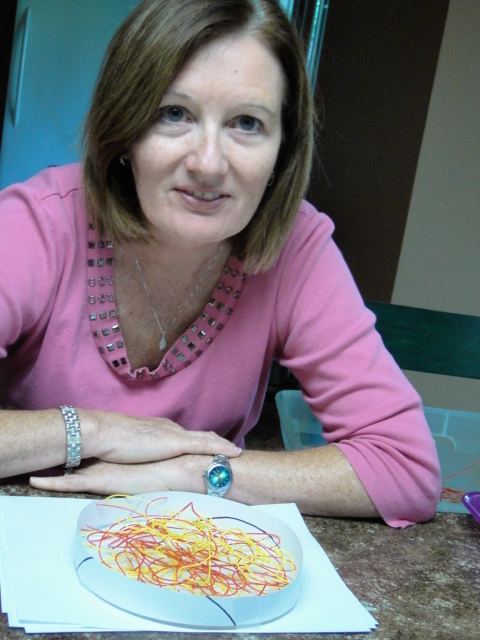 I was able to quickly purchase and receive six from Laurie Spray – maker of the ‘bottomless’ mold. 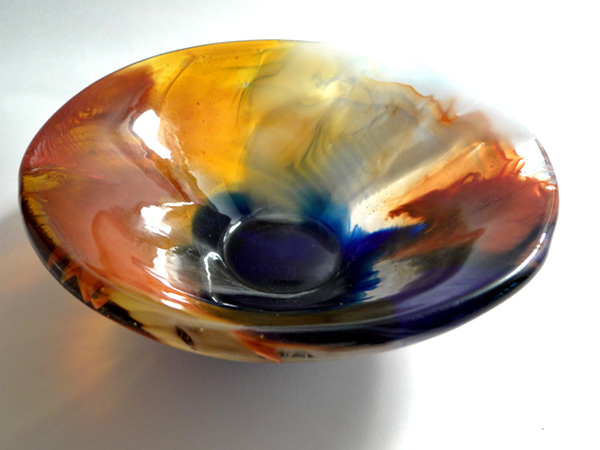 The design makes for a nicely shaped bowl but a solid flat footing as it touches the kiln shelf. It took a few firings before finding the right timing and temperature. 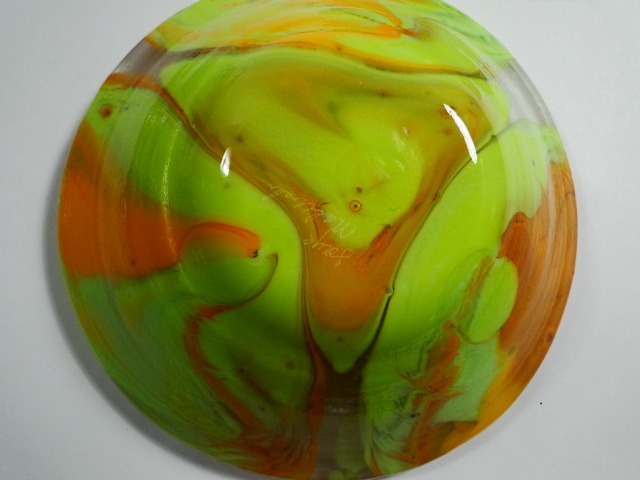 Some bowls were harmed in the testing of these molds! Yes, I messed up a few; making them a little wonkity at the rim, or slight wobble at the base. We experimented with kiln-carving using cut-outs of fiber paper. The cut-outs were both freehand and using commercial paper punches. 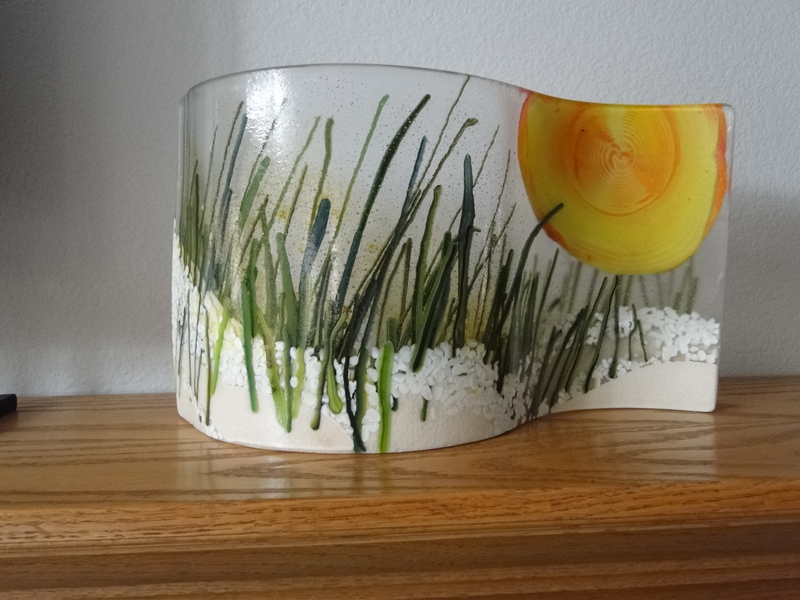 Once the paper is laid on the kiln shelf, two layers of transparent glass are full-fused over the top. The glass becomes crisply embossed with the paper design. Brandy and Christy came up with some great designs and I regret not taking photos of the flat blanks. While attempting to slump them into shape, multiple problems arose…. 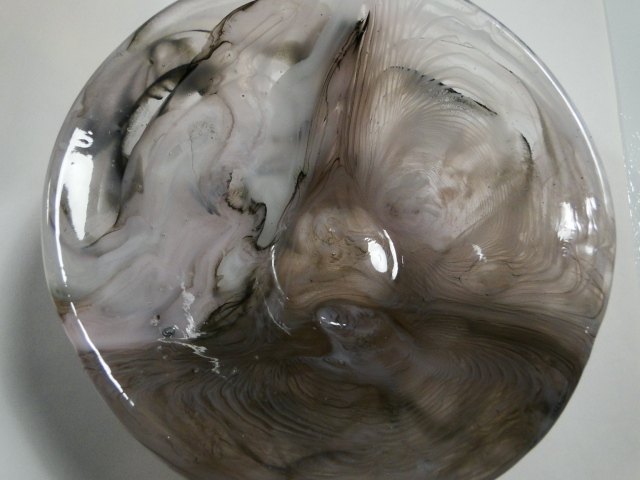 I used too much heat and the glass became cloudy with prolonged contact with the ceramic mold. A few simply slumped into the mold unevenly and look a bit like a scoop. 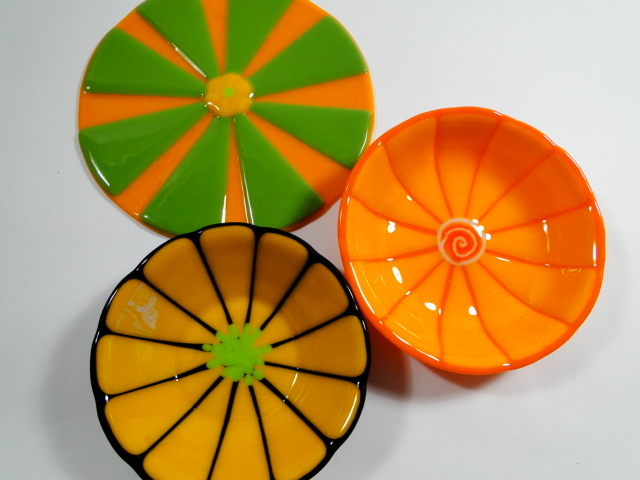 The designs are still visible and the bowls are functional; I just regret ruining their pretty bowls. 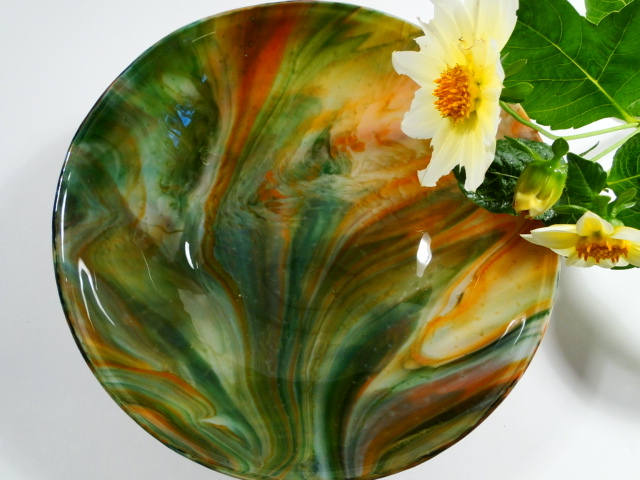 One of my favorite colors of Bullseye glass is blended with shades of green, including a sparkly aventurine. 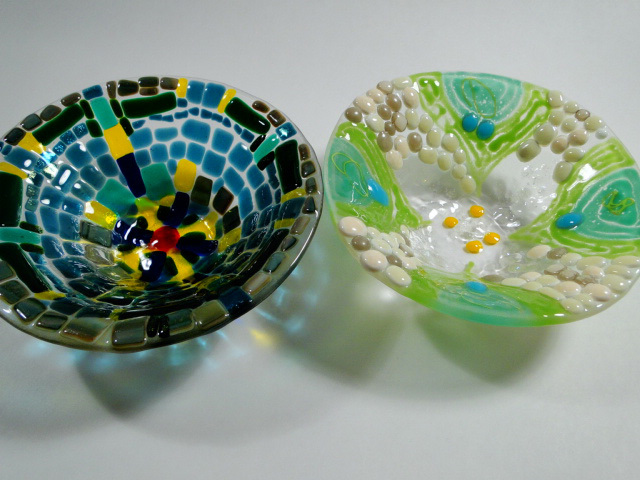 Having only a small amount on-hand, I made two bowls but fusing to a larger background base. No, don’t go whacking your glass with a hammer willy-nilly. Mark a spot with a Sharpie just off-center of the middle. Score some lines beginning at that mark, outward to the edges. When you tap with the hammer, your scores will open up. I usually cover with a sheet of paper to prevent the jagged bits from flying out of position. These were fired to a texture fuse. 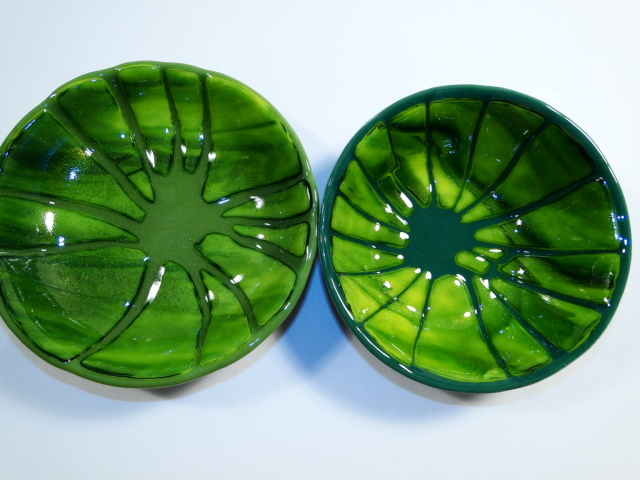 The same firing method was used for the flower bowls – the fusing process shortened so the ‘petals’ are visible. No hammers were used! These were carefully measured and scored into sections. I found I could get fast and accurate lines by using my color wheel with 12-sections to measure against. Great for accuracy in placing clock numbers. I stayed with the flower theme a bit to play with reactivity – a chemical reaction between certain colors resulting in a brown/black/gray line where two pieces are fused. I choose french vanilla and teal; vanilla has sulfur and teal contains copper. The copper-sulfate reaction made a nice brown lining each petal. The semi-hidden work in top right of photo shows reaction with the french vanilla and cyan squares. 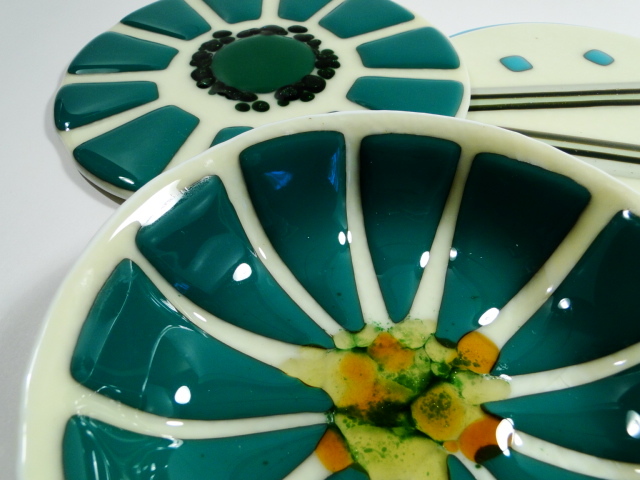 The strips are actually turquoise glass stringers. Turquoise and cyan are copper-bearing glasses, like teal. These square bowls are a departure from the regular bowl slumping. These were made prior to our project starting and have been just waiting for the best home. A simple design of brown sections are textured fired to a black base. 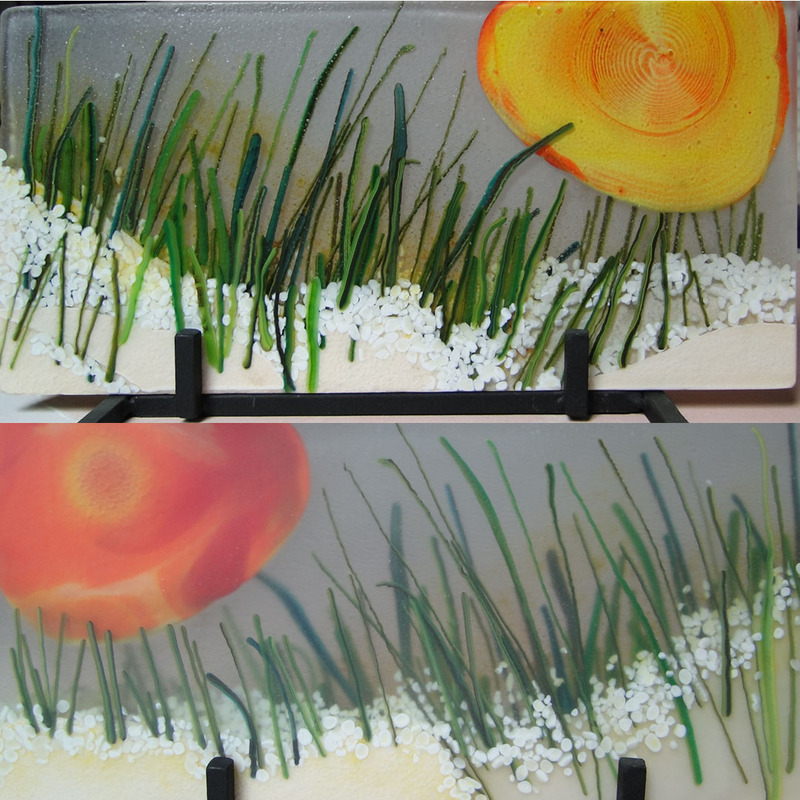 The mold was handmade cutting a square hole in a section of fiberboard; the glass was heated until it dropped through the hole and touched the kiln shelf. 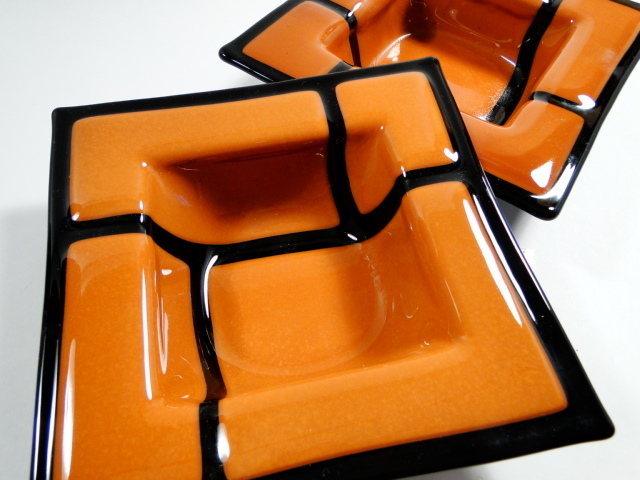 This same square box shape can be altered with fiber paper to change the rim, and I have made many politically incorrect ashtrays using this method. Stay tuned for Part 3… potmelts! In a few weeks – Saturday, November 3rd – Jacoby Arts Center in Alton, Illinois will be hosting an Empty Bowls event to support the Crisis Food Center, also in Alton. Last year we attended and were treated to delicious soups and bread from local restaurants. 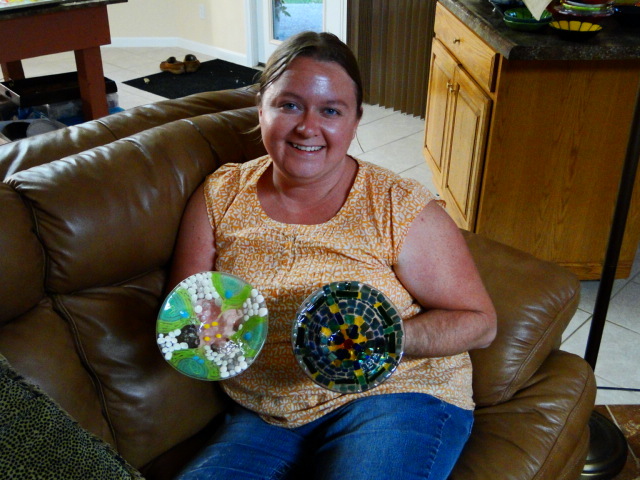 Local artists contribute to a silent auction, as well as making the bowls to filled with soup. On arrival we purchased a bowl to later be filled with our lunch. It was a treat to see a table full of pottery wares made by hand by the artisans. I like pottery and ceramics, and value those that have the skill and vision to create it. My cabinets hold treasured pieces from my old home near Jugtown pottery in North Carolina; I have bowls, mugs, and dishes made locally which I use daily. As much as I like pottery, I LOVE glass. We started simple – with liquid paints we made of glass powder, distilled water and aloe vera gel. 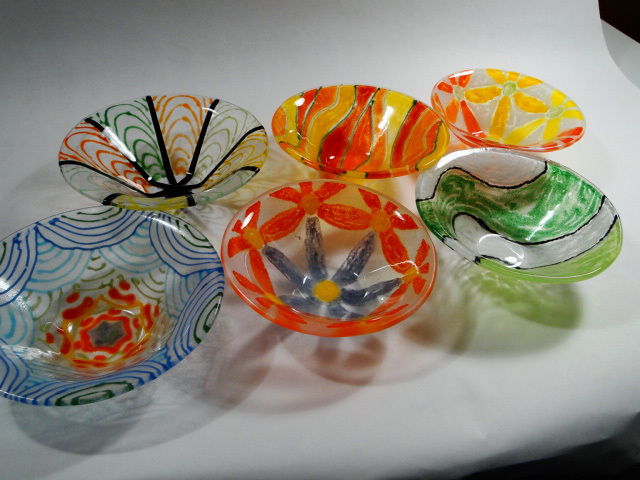 These were applied to a clear base of Tekta glass – the clear made it easy to see a hand-drawn pattern below the glass. It takes a long time for the aloe mixture to dry so they sat for a day and were then coated with a layer of clear glass powder. Most of the glass powders on-hand are transparent which made the glass paint appear streaky and thin in areas. It was fun and easy, resulting in a light-weight functional piece. I would like to attempt this with opaque powders. Brandace had a different vision. Her work took a bit longer using small bits of glass on the clear base. These were fired to a texture fuse, leaving them with more dimension; also a bit weightier in the hand. 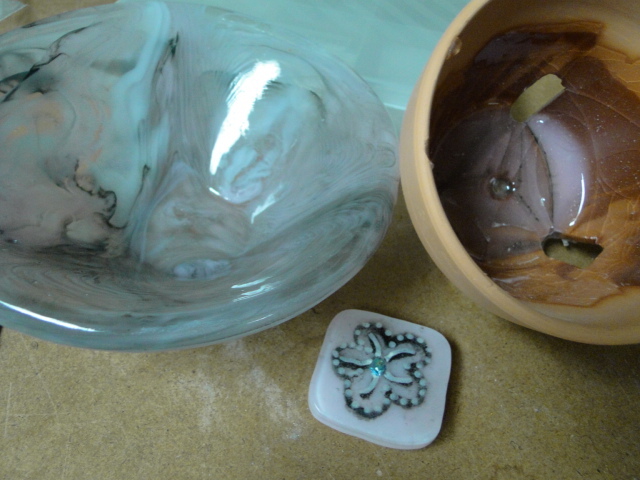 The bowl on the right is a combination of bits plus aloe gel paint. It looks a design by a confectioner – delicate and tasty. 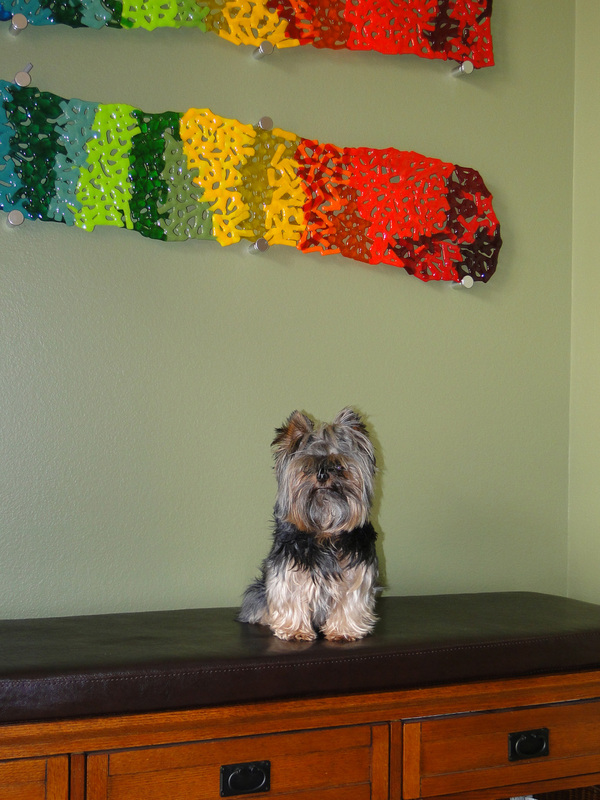 In addition to painting with aloe, Bonnie was attracted to the big bins of hand-pulled stringer (vitrigraphs). Her keen eye found a shaped bit appearing moose-like. We couldn’t figure out a way to overlay it and still keep the shape. More to follow in part 2! Kathryn Nahorski was awarded with the Visionary Leadership in the Arts Award at this year’s Arts and Champagne gala held on September 2012 at the Jacoby Arts Center in Alton, Illinois. She has served in many capacities at JAC including; eight years on the board of directors (formerly known as Madison County Arts Council); five years as the first executive director; then two more years as Assistant Director of Education for the Jacoby Art Center. I was proud to be asked to create something unique and special to honor Ms. Nahorski. To support Jacoby Arts Center, local artists donate art to be auctioned off in a ‘silent auction’ during the Arts & Champagne event. This year’s contribution was one of my favorite “nests”. 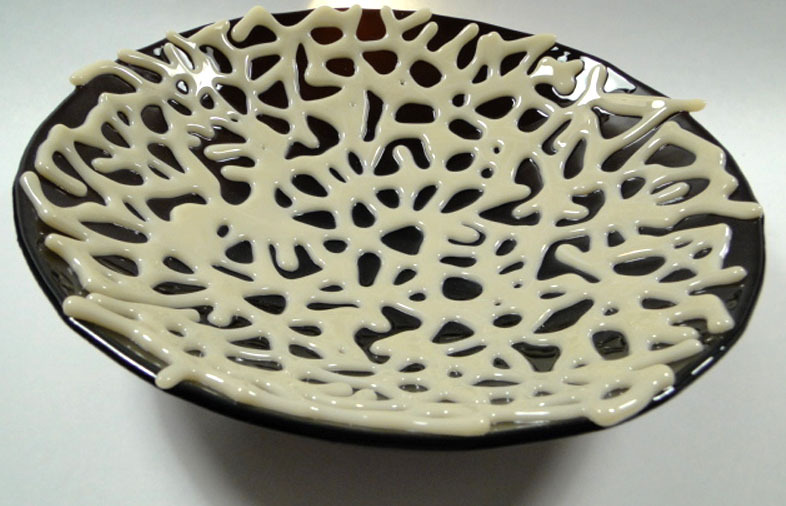 An over-sized shallow form developed with vitrigraphs – varying shades of brown and ivory glass heated to molten, then stretched and curled to become the nest’s twigs. The eggs are glowing dichroic glass. You know you have a dresser drawer for special things. In my case it’s a cardboard box shoved way back on the shelf – out of sight, out of mind. Haven’t touched base with Petah to ask how he views my wanton destruction of expensive lingerie – or is that destruction of wanton lingerie? No matter – at the very first sight of cast glass clothing a number of years ago, my mind went straight to that box. How awesome it would be to preserve delicate lace and fluff into permanence. I signed up as soon as I discovered that Lisa Becker, owner/artist of Art Glass Array in St. Charles, was teaching fabric casting. 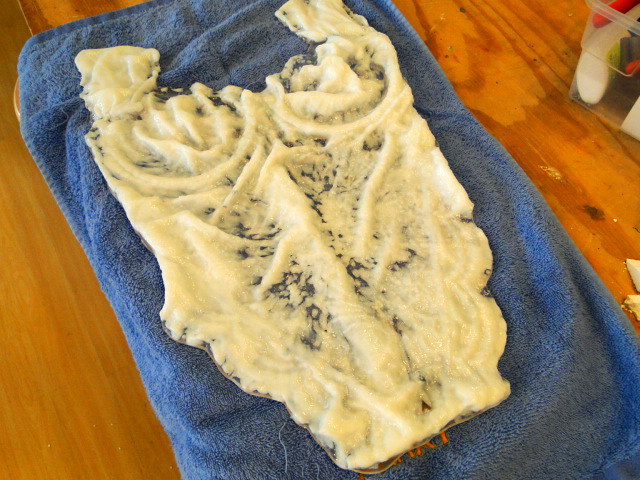 Since I have a bit of experience with casting forms, Lisa talked me through preparation of the fabric. This piece was outside the size parameters for the class so I had an alternate ready – a pair of knitted booties. When I arrived at class, with my pre-prepped teddy, Lisa was kind enough to allow me to use it. Fortunately she was there to walk me through it because it proved to be difficult. The following slideshow will illustrate some of the fun we had while wrestling this large piece. 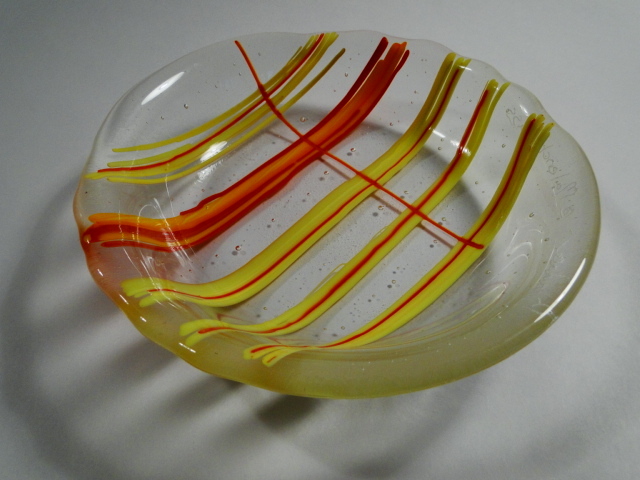 No further hints on how we did the actual work, but I highly recommend the class at Art Glass Array. It was fun and informative. This is an image of the new opaline glass teddy – freshly demolded and requiring surprisingly little cold-working. Two years ago I (we) decided to stop doing art shows, trade shows, trunks shows… basically any sales venue which required us to lift/shift/move equipment and heavy crates of glass; set up a tent and displays; and then reverse that three days later by schlepping it all home. We are not ancient but have started accepting the fact we have certain physical limitations. Two back surgeries come to mind. My husband goes some (alien) place every morning at 5am called “the gym” to stay healthy; yet takes an alarming number of aspirin, tylenol and Motrin just to push his knees and shoulders through his own workday. Shows don’t – can’t – happen without his presence and muscle. He is on-call every-other-weekend. We fit in my shows around those weekends… limiting to say the least. Knowing all that made it easy to begin to sell show equipment. The tent and fancy package of display Pro-Panels went to a good home. I accepted it was time to stop but.. This was really hard to do because we love being in the public during shows. Hate the set-up, love the people. 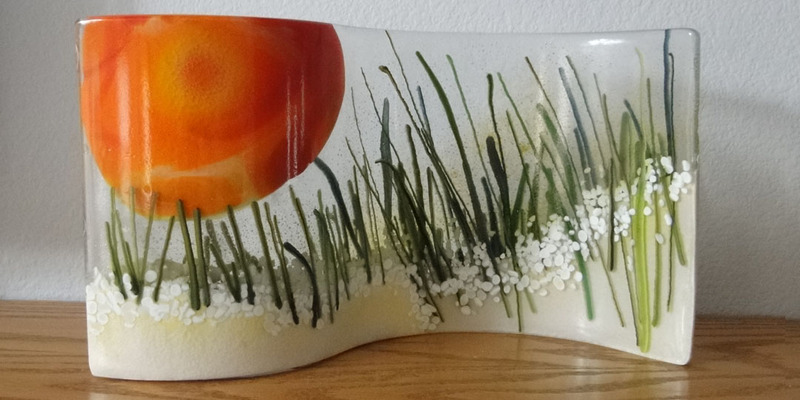 The work is very well-received, sales are good and we even win prizes and extra money because we are just a wee bit different in our fused glass concepts. Over the winter the show invites trickled in via email and applications with glossy photos from prior shows. I forgot that Pete ended up working almost non-stop for 3 months to cover his own job and my shows last year. I forgot the shooting pain down my leg when I lift something too heavy. I forgot how hot/cold/wet/miserable/windy Fall and Spring shows can be. I overlooked the fact of having relinquished all my equipment. So yeah. I did. Applied and accepted. Was over-the-moon happy about being juried into one show in particular. So we began rebuilding our displays. I could have asked the person who bought the Pro-Panels, if I could rent them back. She’s a lovely sort and would likely just loaned them for a few days had I asked… but Noooo. I’m not back-tracking. We had a quickie pop-up canopy tent and mad improv display-building skills… we were going to be OK.
Three weeks before prime-time show season the heat-index remained in triple digits. The air quality was simply non-breathable. I cried a lil bit when I had to withdraw from my dream show. Losing the exhibit fee alone was enough to make anyone cry but I really wanted to be there. I wanted to breathe a lot more. Of 6 shows paid for and accepted into, we did only 2 last season. The income from those two reflected the economy and almost paid for themselves. The other four were almost a complete loss – we received partial refunds. All too ugly. St. George Island was intact and simply beautiful for the ten days we visited. The expected oil was nowhere to be found though the thought, and conversations about it, were ever present. Long stretches of some type of barrier were being put into place to prepare for the eventual arrival. The sand was clean and the air fresh – the water was mostly clear and bathtub warm but lots of sea-grass was churned about by tropical storm Bonnie while we were there. The last day the seas calmed down enough to really enjoy the water. Only one day of thunder, lightening and rain but we enjoyed watching that too. Our beachfront house sat 4 stories high and we camped out on the balcony to watch the dolphins jump and play as they fed. They entertained us for about an hour each day as they passed on their regular feeding route. No one commented on the dolphins other than how much fun they were to watch but from my own knowledge of them, they were much closer to shore that I expected. If that was a function of the storm or the fouled waters further out driving them toward shore, I can only guess. This trip was for my Aunt and Uncle’s retirement. They love the beach as much as us and we waited impatiently to plan this trip and time away with them. Peter spent countless hours tracking down this area and house we rented. While the trip from Illinois was excruciatingly long for me, it was well worth it. We simply had a blast! My Aunt is never called “aunt” because she has too many roles to be pigeon-holed with a label. As my Mom’s youngest sister, we are fairly close in age. I was even her chaperoned on her first drive-in date with her husband. With over 50 years of history between us, we never lack for anything to talk about. She alternates between aunt, mom, sister, and best friend to me – depending on the need. Mostly we laugh – hysterically. For no reason. When my Mom was living it drove her crazy when the two of us would launch into those spontaneous laughing/crying episodes. In my mind, I can see her now – rolling her eyes at us as if to say “there they go again”. We pretty much can’t be trusted together in public without embarrassing ourselves or the unfortunate people in our group. It’s all good. One of my old friends and co-workers from Gainesville drove up with her husband. It’s been 12 long years since we set eyes on each other. Thanks to Facebook we hooked up again. She’s still a delicate lil blond Barbie. Her husband, Jerry had real trepidation about going off with strangers but I think within 5 minutes he was at ease. He fit right in and kept us laughing and having fun the whole time. My Aunt and I cooked tons of real Southern food and carried it along. We were both thrilled that he had an appetite to go along with his sense of humor. We loved every minute they were there. Yes I got a little misty-eyed when they left because the thought popped in my head that 12 years between good friends is simply too long. Ahhh the food… fried grouper, fresh-from-the-sea shrimp. Though Pete has a propensity toward sea-sickness, he manned-up and booked us on a fishing trip. Hot day. Oh so hot day when we set off with the captain. Just the three of us chasing about the bay in a decent sized boat. Immediate bite – and catch for a sea trout on the first stop – then lady fish and catfish abound – plus one shark. Oh, P brought in a clump of edible oysters with a hermit crab hitchhiker. After 8 or 10 different locations we ended up with 3 beautiful sea trout, cleaned and frozen for travel. By our estimation we could be eating the finest caviar for the price we paid for 3 fish. The outing and the adventure… priceless… Thank you P for not losing your lunch. On the last day the sea-grapes cleared out of the water and the dorkie yorkies got in for a swim. Each have their own life-vests for safety and we started them out wearing them. Our porkie yorkie, Milo has as much flotation around his belly as the vest so he tended to capsize. After we took off his vest he swam and swam like a champion. The waves would wash him in to shore and he’d turn back out to deep water. Rawlph’s long fur coat floated out around him like some exotic sea creature. He swam fine but really didn’t care much for it. Cricket cracked me up – she didn’t exactly invest all her legs in to the mix… if you lifted her from the water she only had one front paw paddling like mad. No idea how she stayed afloat. While swimming is not her forte, she’s an intrepid hunter. At home no frog dares to enter her domain. No ground mole run goes undug. She may have met her match when she went muzzle to claw with a crab nearly her size. She chased him under the house. Mr Crab ran amok for a bit searching for a burrow. Finding none, he turned to do battle. Pete grabbed her just in time. The running ghost crabs at night made for great adventure, too. We celebrated P’s birthday there. Unlike his 40th, when he asked for a weed-whacker, he had no special requests. We decided on an island birthday, and searched the local gifts shops for fun things. I so regret not picking up the bobble hula girl for the dash of his truck. Jerry took the crew out for dinner. Another great seafood meal at “That Place off 98”. Neither the island nor Apalachicola had a birthday cake to be found so we settled for a frozen Sara Lee chocolate silk pie. That worked fine and we used a flashlight as a pretend candle. These flat panels are actually one and the same. Taken prior to the last firing in case something untoward should happen in the heat. That sun pot-melt was suspect and is being treated with caution. Now it is slumped into a deep wave and on my mantel to remind me of a happy trip with wonderful people.